Some of you may recall our “Reinventing Our Streets” issue from back in May of 2010. With our community in the midst of planning two major street redesigns at the time – the now completed Hastings Way and the upcoming Barstow/Eau Claire streets redo – we thought it apt to get a bunch of interesting ideas and examples out there, in print and online, to get a meaningful conversation started about how a street can mean more for a town than just getting cars from point A to point B. So now, with the recent release of the city’s latest Waterways and Parks Plan (after the last one was published nearly 25 years ago), we felt this was another opportunity to “make a splash” so-to-speak – to elevate some river-based concepts and discussions to help set the tone for improvements to our community’s relationship with our rivers going forward. 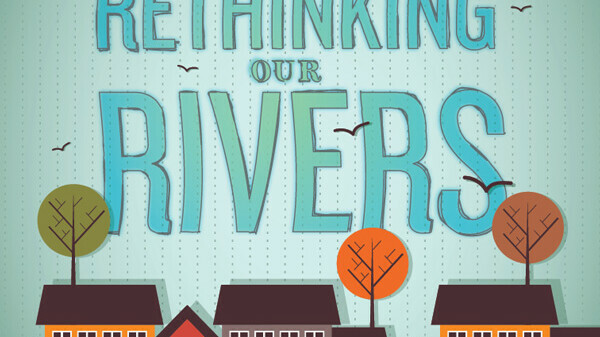 To that end, you’ll find the vast majority of this issue is dedicated to the theme of “Rethinking Our Rivers.” There’s a major series of features starting, but there are also badges throughout the entire issue denoting ideas and articles that bring something to the river theme as well. This whole issue can be found online at VolumeOne.org/rivers, along with some videos and interactive elements, where the community discussion can take shape via comments and posted images. We hope you’ll bring your voice own to the mix as well, and together we can make Eau Claire a world-class river town.